You'll be £12.99 closer to your next £10.00 credit when you purchase Saladin. What's this? The extraordinary character and career of Saladin are the keys to understanding the Battle of Hattin, the fall of Jerusalem and the failure of the Third Crusade. He united warring Muslim lands, reconquered the bulk of Crusader states and faced the Richard the Lion Heart, king of England, in one of the most famous confrontations in medieval warfare. Geoffrey Hindley's sympathetic and highly readable study of the life and times of this remarkable, many-sided man, who dominated the Middle East in his day, gives a fascinating insight into his achievements and into the Muslim world of his contemporaries. Geoffrey Hindley is a distinguished medieval historian who has written widely on many aspects of the period. He has made a special study of medieval warfare and of sieges in particular. His previous books include Castles of Europe, Medieval Warfare, England in the Age of Caxton, Under Siege, Tourists, Travellers and Pilgrims, The Book of Magna Carta and The Crusades. His most recent publications are is A Brief History of the Anglo-Saxons and Medieval Siege and Siegecraft. Although the book is clearly favourable to Saladin, Hindley has done an excellent job in explaining the politics of the Middle East in the late 12th Century. The author has gocused his study on the rise of Saladin as a great leader, and he has given less weight to those details and events on which more western minded authors tend to focus. Despite the fact that it has made his book too one-sided, his work is highly recommended to those interested in the Muslim side of the story, especially if they are familiar with more conventional western narratives about the Crusades, a knowledge of which is necessary to put Hindley's work into perspective. 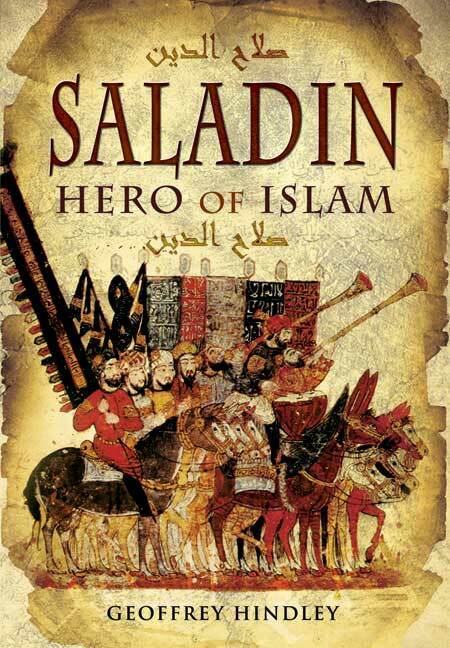 If asked to name a Muslim military hero I suggest that the readers of this magazine would usually plump for Saladin. Even at the time when he was the Crusaders' feared and implacable enemy, he was celebrated in Western histories and literature as a man of high morality and great skill. Bizarrely, he even appeared in one popular Old French text - The Ordering of Chivalry as the noble individual best suited to instruct a Christian knight in a proper behaviour! He is best known for opposing the Third Crusade and Richard the Lionheart's attempt to recapture Jerusalem in 1191/92; but he actually spent more of his life fighting muslims. It was his ability to create an empire stretching from Egypt to Iran (he was a Kurd), which enabled him to conquer the Kingdom of Jerusalem after his great victory at Hattin in 1187, and hold it against all comers. The author provides a lively and readable account, not bogged down with footnotes, but fully revised from its original 1976 text and of a high scholarly standard. This book will serve both the general reader and a student of Crusader Studies (which many universities now provide) equally well. My only disagreement is with his interpretation of the garrison of Acre after its fall, due to Saladin's procrastination in negotiation. He should have ransomed them, and lost the battle of Arsuf as a result, because his soldiers had lost faith in him; but then, he won the war. Saladin is best know in the west for his conquest of Jerusalem and his clash with Richard the Lionheart, but his life and career was much more complex than that. Saladin was something of an outsider - a Kurd operating within the largely Turkish leadership of Syria, but he became the most powerful figure in the Islamic world and the ruler of a sizable empire held together almost entirely by his own abilities. Hindley's biography begins with Saladin's moment of glory, the fall or liberation of Jerusalem in 1187, before moving back to look at the world that Saladin was born into, the rise of his family and his own early career. He then moves on to examining Saladin's rise to power, first as Vizir of Egypt and then as a major ruler in his own right. This was the section of the book that I found most valuable, presenting us with an inside view of a world that is so often seen from the other side, simply as the enemy of crusaders. The climactic clash between Saladin and the Crusaders is dealt with in some detail. The campaign that saw Saladin win his most famous victory, at Hattin, effectively destroying the Kingdom of Jerusalem, and the campaign against Richard the Lionheart, are both dealt with in some some detail, but so are the campaigns that filled the years between the fall of Jerusalem and the arrival of Richard. This is a valuable biography of one of the most attractive figures in Medieval history, a rare example of a leader who was respected on both sides of the religious divide in the Holy Land, and one whose reputation has deservedly survived intact across the intervening centuries.